I really do like that bean trellis you made . Thats intresting that you live in westfield . Im going to look for that book , hey what would you plant underneath it? lettuce ? I would love to make that proballly not so big . Even though I would love to ! Hey good luck with your garden . 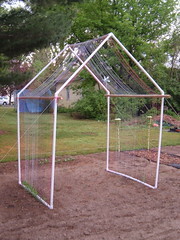 I have a little plastic greenhouse that houses many of my small plants , they are almost ready for planting . I think i'm going to wait until Mothers Day to plant as thats the traditonal time . I wish you would have posted this yesterday. I have done my peas on two planting this year to technically, I would have neat to have this as part of my garden plan about 2 weeks ago. 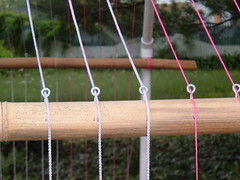 - Ok, most of my garden is simple functional. thanx for the comments guys and sorry about that Roy What's nice about this is that I didn't glue the pieces together so in the fall I can just take it apart and store it for the winter. I also had to anchor it on the four corners because of the winds we've been having. I just planted more spinach inside or under the house. Once the peas are done, I'll move it to where the Lima beans will be and then grow more lettuce for the summer. I like that. Do you mind if I swipe one of your pictures to print to have my favorite handyman build a few for our garden? We've had some volunteers grumble about the teepees we use and how difficult they are to put up (don't know what so hard about lashing some 8' poles together but don't want upset volunteers). LOL...that is too funny Gardenlady...by all means, help yourself. Talk about grumbling, you should have heard me when I was trying to put the whole thing together. I had the "roof" together and then trying to get it attached to the sides was rather comical. I'd get one side attached and then the other side would collapse. Go to that end and then opposite end would collapse. If my neighbors were watching, I'm sure they thought I was crazy. I'm not the most "mechanical" person. Just be sure to anchor it if you get strong winds like we do here on the Eastern Shore of MD. I woke up one morning after the house was standing for a week to find it laying in a tangled mess. We get very strong winds here too; not too far from the Lake Michigan lake shore. How did you anchor this? I can never get bean teepees to work, and have some ladder trellises set for pole beans this year in a walkway kind of archy display, but am always looking for better anchoring methods. I have bamboo growing wild just beyond my property Bumblebee so I took four 2.5' pieces, trimmed off the branches so I'd have "hooks" on the sides. Took a length of string and tied it to the Bean house and to a stake and just hammered it in till I had maybe a foot above ground. I did this on all four corners. 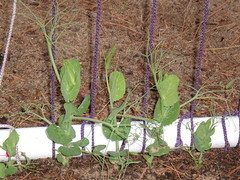 Once the peas took hold and started growing, I was able to remove the stakes. Another thought I had was to drill two holes on each end of the "ground" pipe then use long tent stakes but didn't want to spend the money for a pack of 10 stakes Let me know how it goes!